I’ve already switched from this product to Norton Internet Security 2010 on my primary production machine (I didn’t want to leave the machine in an uncertain state while working through this problem), but I’ve left it installed on one of my test machines and am working with PC Tools technical support to try to understand and resolve this issue. Last Thursday, I conducted a Web chat to report my problems and ask for some advice. 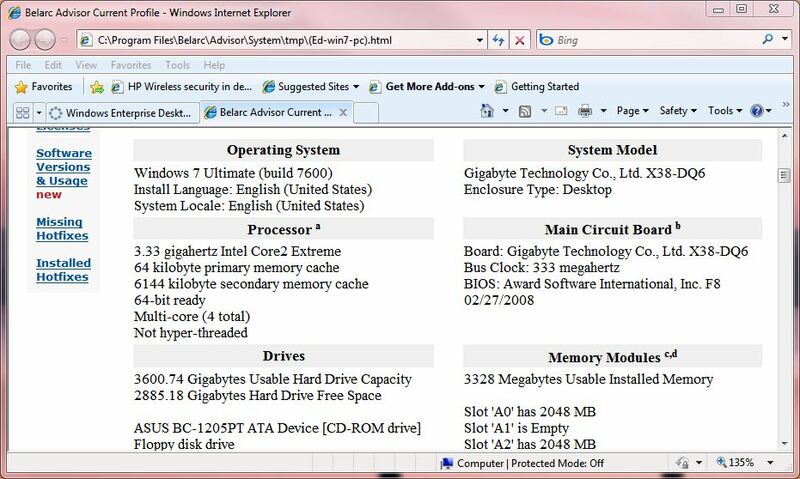 The support tech had me stop the Spyware Doctor run-time environment (right-click the icon in the notification area, then select ShutDown from the resulting pop-up menu), uninstall the running version of Spyware Doctor, download a fresh clean copy from their Web site, and reinstall the program. After three days with no problems I was starting to hope that my failure to halt the previous version of the app before doing the first install of the current version caused the problems, but when I logged into my test machine first thing this morning, I found the pctsSvc.exe app crash message waiting for me on that machine when I checked in. It looks like a pretty informative tool, but I didn’t see anything in the output from the free version that would help me or anybody else tackle the Spyware Doctor issues, so I’m guessing the commercial version that PC Tools will send me will provide a bunch more detail, especially on security -related matters. One big concern for many such software companies is the presence of malware that could inhibit or block correct behavior on a PC (which I’m 99% sure is NOT true for this machine, having scanned it with Trend Micro Housecall and the Norton Security Scan and come up clean on both), while another has to be the presence of other programs, drivers, or runtime environments that interfere with the PC Tools runtime environment’s proper operation. 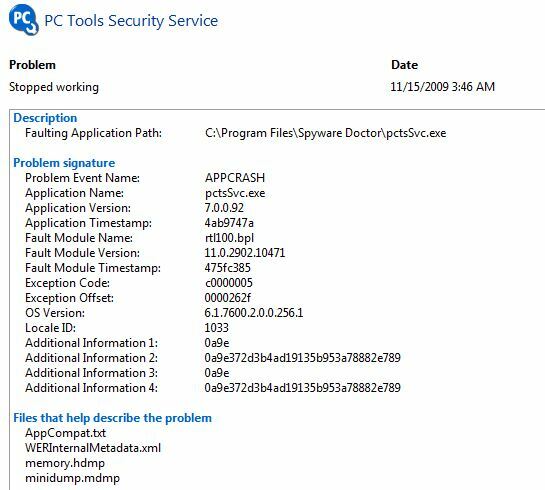 This promises to be an interesting and educational adventure as I work with PC Tools to figure out what’s bollixing Spyware Doctor with Antivirus on my test machine. I’ll keep you posted as things develop further. [Note added 11/21/2009]: I never heard back from PC Tools Tech Support despite an e-mail follow-up on 11/17. I guess I’ll have to start a new trouble ticket tomorrow. Count on me to keep following up as more info becomes available. In the meantime, pctsSve.exe crashed again on 11/18 and 11/19.